With the summer winding down, many of you may have your garage littered with the remnants of your various summer projects. Perhaps your garage has become overrun with bags of soil, wheelbarrows, gardening tools, hoses, yard bags and all other types of gardening and landscaping paraphernalia. 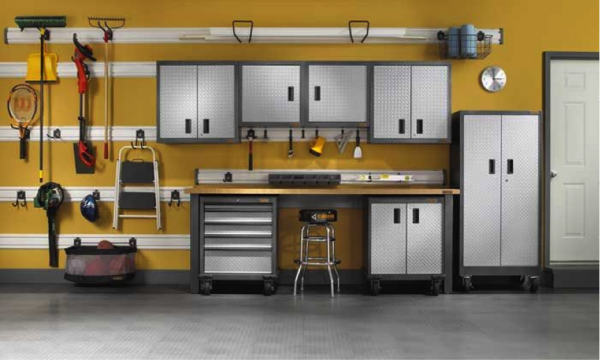 We thought this week it might be helpful to give you a few ideas of ways to organize your garage space effectively to ensure that it’s both an accessible and useful space as we enter into Fall – and eventually Winter. The first thing that you should consider doing is getting everything (applicable) off of the ground. There are a number of ways to do this: racks, shelving, and hooks. Racks can be used to hang, organize and store larger tools like shovels and rakes, while hooks can help you to keep items like your hose, and/or weed trimmers from taking up too much space. Next, Shelving and plastic bins can help you to organize like items and stack them out of the way while still allowing easy access when you need them. This will free up floor space for your larger items if necessary, or your vehicle during inclement weather. You’ll want to make sure that you have a clear path, and easy access, to the seasonal items that you’ll inevitably need the most. A clean and organized garage ensures that you can quickly and efficiently locate the items you need, when you need them – eliminating a lot of headaches. It also makes the space suitable for tasks such as woodworking, which require not only free space but also protection from weather fluctuations. Are you planning on reorganizing your garage this season? Do you have a great looking garage you’d like to share with us? Be sure to visit our Facebook Page and let us know!